Goat island skiff in Gothenburg: A sailing weekend! 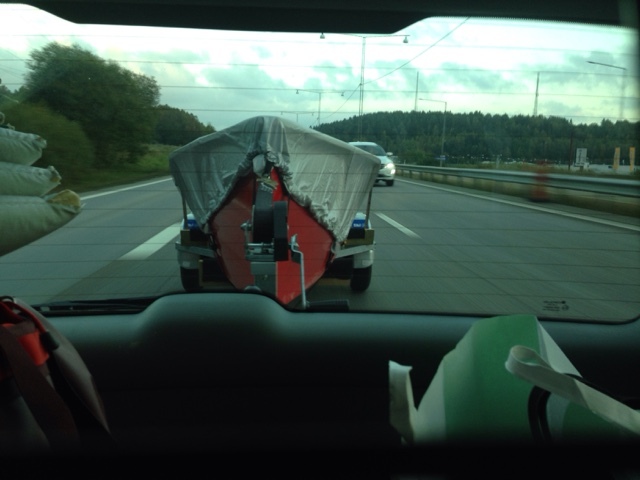 A week ago, Marius Olsen who is on the final stretch of his GIS build asked if I was free for coffee and abut of show and tell since he was passing Gothenburg on his way to France. I wasn't, but asked if we could meet up at our summer house on his way home. Their plane was to arrive Gothenburg in the morning so that seemed possible. Therefor, Rackham the red was hitched to the car when we departed for Orust on Friday afternoon. Saturday offered splendid autumn weather. Calm, a bit of fog that was clearing as the sun heated up the air. 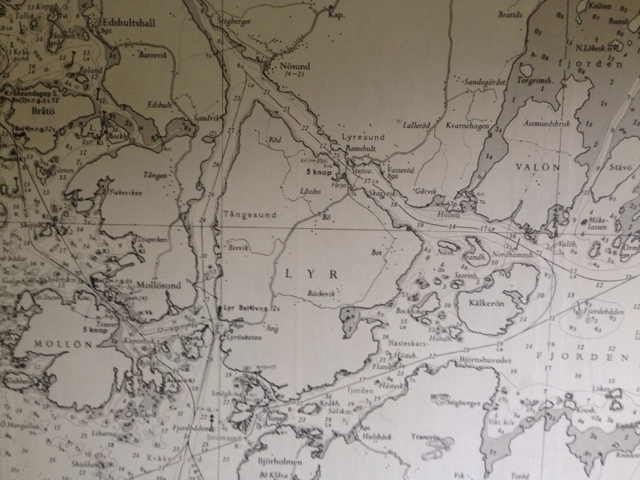 Harry and I put the boat in the water at the Lyrösund ferry and coasted with the current towards the small village of Nösund. Here the wind picked up fast and we tacked up towards the fishing village of Mollösund. No fast powerboats, one or two sailboats in the distance and a lot of lobster fishing small boats, a steady 6-7 m/s breeze, and Saturday candy in our pockets. At the outside of the island Lyr the waves got bigger, and when we turned towards Smögholmarna we surfed the waves on a reach at fantastic speed. When we passed Smögholmarna the water flattened and we had smooth downwind sailing more or less all the way back to the ramp. All in all, we had a great sail! 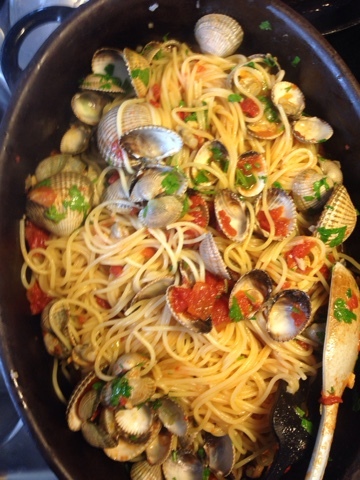 Coming back the the house, my mom had prepared Spaghetti Vongole, Yum! Sunday Marius and his family turned up at lunch time. We had the sail up, discussed details on the rigging, the workings of the GiS rudder and its relative merits, etc. and then had lunch with more boat talk. It was very fun to meet in person. Plans were made for a Northern Europe meet up. Next summer there might be three GISes in Norway, so if we can trick someone from the continent to join we can brake the record for most Goat Island Skiffs at the same place (current record is four). 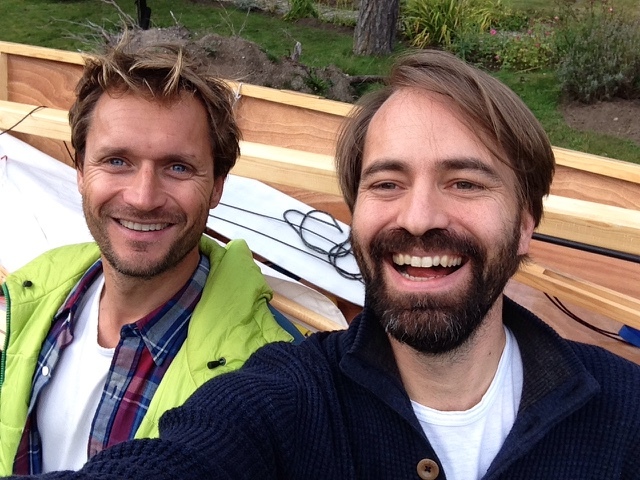 Marius, thanks for the visit and the French cheese and sausage, hope to see you soon again! we'll be five, you bet!